Found 7 file extension associations related to SoftMaker Presentations and 3 file formats developed specifically for use with SoftMaker Presentations. With SoftMaker Presentations you are able to create stunning presentations that will catch your audience’s attention in no time. The program offers a variety of design templates, objects, and graphic effects thus enabling you to create a multimedia slideshow that leaves nothing to be desired. An innovative new feature in Presentations is the huge number of animations and transitions based on DirectX technology. Meet state-of-the-art graphics technology that goes beyond anything you ever experienced from a presentation graphics program. Animate your slides as puzzle, let them turn over like book pages, or let them burst into flames. Of course the program also offers a great variety of unobtrusive effects and classy animations to imbue your presentation with a more “serious” touch. With this powerful presentation graphics program, your creativity knows no limits! 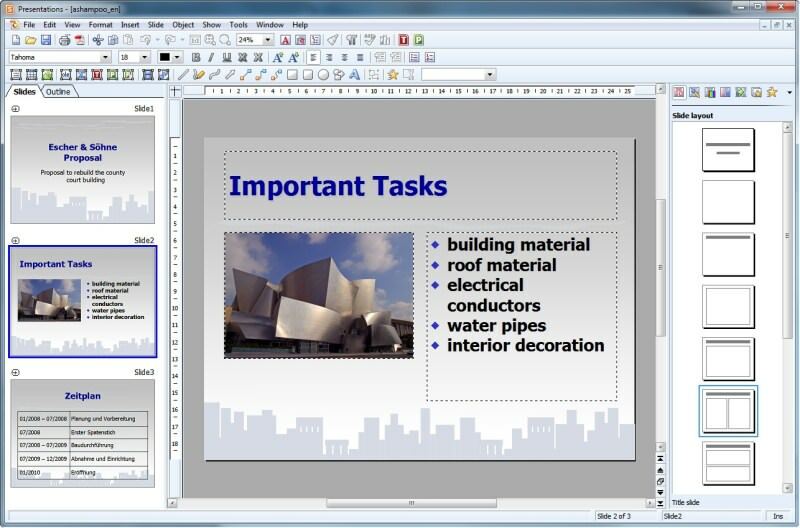 Embed graphics in different formats, use AutoForms, crop pictures directly in the program, embed movies or audio files and use different effects like reflections, shadows, transparency or antialiasing with your objects or text blocks. Go ahead and save/export your presentation in a file format of your choice, like for example as PowerPoint presentation, HTML website or PDF document. If desired, you can also print handouts for your audience. SoftMaker Presentations is the presentation program for SoftMaker Office and is also licensed to other suites such as Ashampoo Office. If you need more information please contact the developers of SoftMaker Presentations (SoftMaker Software GmbH), or check out their product website.